When id decided to go photographing in the Sharavathi region of the Western Ghats, the Blue-eyed Bush Frog Philautus neelanethrus now known as the Coorg Yellow Bush Frog Raorchestes luteolus was amongst the top of my species list. This species features under the 'endangered' category in the IUCN list of endangered species and is endemic to India. 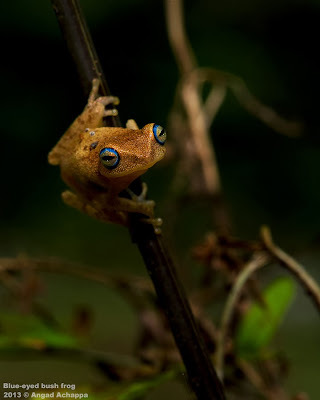 The bright blue ring running around its protruding eyes is what gives the frog its common name, its scientific name neelanthrus mean 'blue eyes' in Sanskrit. This species is considered a 'new' species as it was discovered only in 2007. 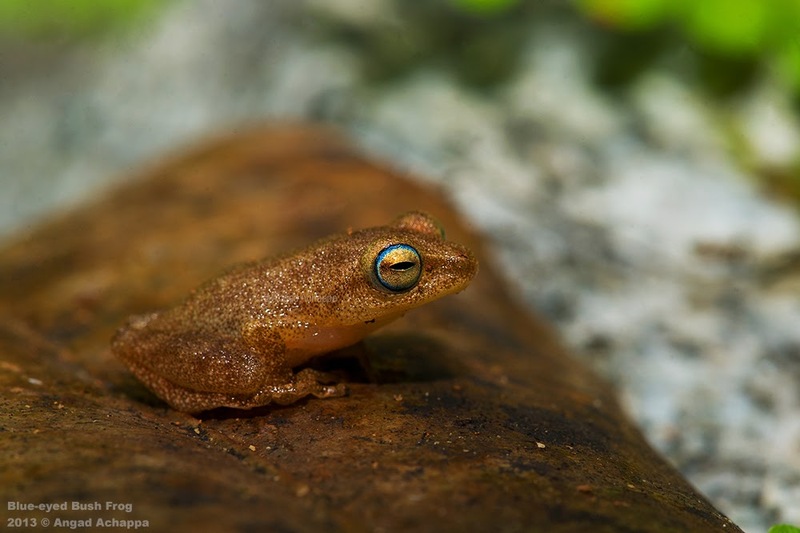 The blue-eyed bush frog avoids barren lands and areas involving human activity such as agricultural fields or urbanisation. The main threats to this species are loss of habitat due to building of dams and conversation of forests to agricultural land. A nice colorful one Angad! I just found this blog and I'm so excited! Thanks for sharing your insights to issues that really speak to the challenges of our Digital Fine Art Photography profession in the 21st century. I am industrial photography and i love to capture beautiful things. I loved your photography. thanks for sharing.